Nikita Review: Will Division's History Repeat Itself? Amanda returned with a masterful and vengeful plan in "Black Badge. 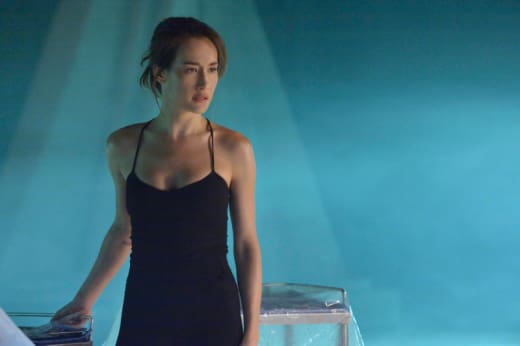 After a way too long hiatus, Nikita season 3 returned with an epic hour that put one of their own in harm's way. While Sean may not have been officially part of Division, he was a member of the team in the way that mattered the most: in their hearts. While the old Division discarded the damaged, the loved and those who made errors, as Nikita pointed out to Ryan, the new Division was different. They wouldn't leave Sean out to take the fall for something he didn't do. Also, they didn't force him into a new, secret life either. He had a choice, took it, and officially became a Division recruit saved from the law and given a new life. Amanda was always diabolical. She enjoyed the power of Division, torturing recruits, and the nefarious side of the business. She's been manipulative, but not unbeatable until now. This time, she put together a plan that was masterful and stayed steps ahead of the new Division team from start to finish. She used the mission of the new Division against itself to take Sean's life as he knew it. What initially appeared to be a government leak to a CIA analyst, Naomi, was much more than it appeared. It was the first step in Amanda's elaborate plan to assassinate Kendrick and blame it on Sean. It wasn't clear if she actually wanted Division outed as an illegal arm of the government or not, but Ryan and Nikita were able to protect that secret at least. When Division figured out that Amanda was going after Kendrick, they put together a plan to protect him and all seemed good until the car exploded. They didn't account for it being an inside job. That's where Amanda won this battle. She implicated Sean with the altered video footage and sent the team searching for the real guy on the street. Even after they realized he was just a common criminal, they didn't pursue the inside traitor. They followed the clues that Amanda left for them, which gave her the time to further set up Sean with a faked motive, while protecting her inside source. I never saw the reveal that Naomi was working with Amanda coming. Nice job, writers! Watching Amanda's plan unfold was a highlight of the episode and only outdone by the action packed fight between Nikita and Naomi. That was outstanding fight choreography, right up there with the best on television right now on Arrow. Nikita's move to distract Naomi with the comment of the shoes worked well. And, after putting a knife in Naomi's chest, Nikita took those shoes as a fight prize. Did Amanda ultimately win? Tough call. She did get away with killing Kendrick and ruined Sean's life, so I'd count that as a victory that was only slightly incomplete. Amanda's lesson that every operative is disposable went against everything that Nikita and Ryan are trying to accomplish. And, Amanda failed in her teaching. Sean has a tough road ahead of him now that he has left his family and career behind. And, as a Navy SEAL it will be difficult for him to continue knowing he "died" with the world believing he was a killer and traitor. He never wanted to work at Division because he didn't believe in it, but now he is stuck there presumably forever. At least he has Alex, but will she be enough? As much as Ryan and Nikita believe they are running a new Division, it is still an illegal arm of the government. Most of the people working there are "dead" and the assignments they will be given are unofficial. It's a slippery slope and the new Division gets closer to the edge every day. Amanda failed at her lesson today, but how long before that lesson is learned? Or will Ryan and Nikita be able to keep their power in check and say no to an operation if it is outside the lines of what they deem ethical? Your mother was a good woman. She didn't deserve to die. Permalink: Your mother was a good woman. She didn't deserve to die. Yes, Alex, the lesson is that every operative is disposable. Permalink: Yes, Alex, the lesson is that every operative is disposable.